Two piece baby girls gift set. 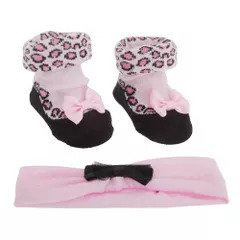 Includes 1 x pair of socks with leopard print design and bow detail and 1 x elasticated headband with bow detail. Little Angel text design on soles of socks. Choice of 3 colour packs. Choice of 2 Sizes: 0-6 Months or 6-12 Months. 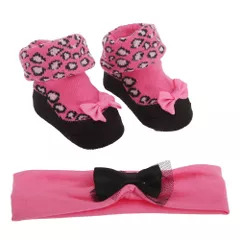 Socks: 75% Cotton 20% Polyester 5% Elastane, Headband: 100% Polyester.